If you’re looking for a book about falling in love, this ain’t it. But if you can be seduced into a mystery set in an exotic locale that includes lots of backstage shenanigans in an opera house, this one’s for you. Over the course of nearly thirty novels, Commissario Guido Brunetti, a police detective in Venice, Italy, along with his wife, Paola, and a coterie of characters ranging from café proprietors, feisty old Italian crones, detectives at the Questura, and a luscious assistant to the inept and arrogant Vice-Questore, captivate readers again and again. Brunetti’s cases take him into all walks of life in Venice, from the wealthy to the destitute, from street gangs to the Catholic Church. Murder and mayhem knows no boundaries. In Falling in Love, Leon returns to the setting of her first novel: La Fenice, Venice’s jewel box of an opera house. The book opens as Flavia Petrelli sings the final notes of “Tosca” and hurls herself off the Castel Sant’ Angelo as the curtain comes down to thunderous applause. Before Venice, Flavia graced the stages of Covent Garden in London and the Palais Garnier in Paris. After Venice, she will head to Barcelona. On the surface, she has the life of which every singer dreams. But all is not as it appears to her adoring public. Once the curtain comes down, the stars, conductor, and director who were holding hands and pecking cheeks during curtain calls, drop the façade and separate without a word, delighted to be free of one another. Flavia escapes to her dressing room and is terrified to discover that the stalker who has dogged her all over Europe is now in Venice. When she goes home that night, it is evident the stalker has been there as well. Not a good night for Flavia, but things are off to a good start for the reader. I’ve spent years on the edge of the opera world, backstage, and in the company of the brilliant people who bring every phase of an opera to life. 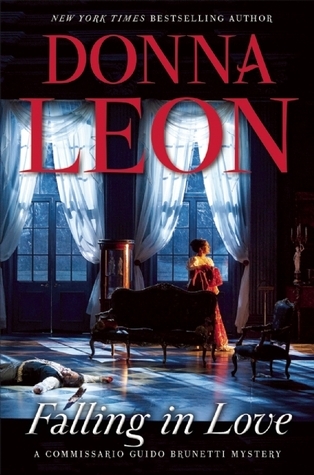 Donna Leon has captured it perfectly – the highs and lows, and much of the drama. If you read a passage and think, “Oh, come on,” trust me: it happens. It all rings true. In Flavia, we see the divided world of singers who travel constantly, live alone in hotels or small apartments (though Flavia’s digs are deliciously palatial), missing family and friends, and depending on Skype for connection. Colleagues come and go – some they love, some not so much. But it’s all worth it the moment they walk onstage and into the rush of the performance and the applause which follows. Thrilling, but not an easy life. Opera is at the center of this book, but Venice is also there in all her glory, as is Paola in her kitchen, and the hilariously stifling bureaucracy that is Brunetti’s work world. It’s wonderful, as always. And here is a special treat: many readers (like me) treasure scenes where Paola is whipping up a simple and delectable family lunch. 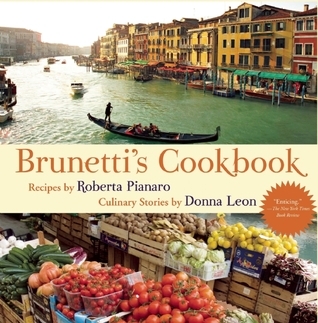 Donna Leon has collaborated with Roberta Pianaro to create “Brunetti’s Cookbook,” which has wonderful Paola-esque recipes interspersed with fragments of many of the books. It’s a gem! Finally, thanks to all of you for sticking with me through a very rough start to 2015 which kept me from reading and writing for several months. But I’m back and ready to take on the rest of the year! Glad to hear you triumphed. I’m looking forward to your next review. Thanks for the kind words, Jean. It’s good to be back. So pleased to have you back and hope things are okay. I am sorry if things did not stabilise. Kerrie! So good to see your name here. I’m doing fine, but we lost Hollywood in January and I could not hold a coherent thought in my head for quite a while – let alone write. Bit better now.